Dr. Justine Lee is OK with Valentine's Day but advises against bringing dangerous foods and flowers into your home for the special day. For more from Dr. Lee, find her on Facebook! Ah, the Hallmark holiday of romance. While I’m all for receiving flowers and chocolates on Valentine’s Day, I actually never really celebrate this day. Why? Because I’m a neurotic pet-owner and vigilant pet-proofer. Since I have pets in my house, I don’t want to risk accidental poisoning to my dog and cats. So, men: for once, you can skip the flowers and sweets! First, the flower bouquet. The reason why bouquets are so dangerous is because they often contain lilies in them. Unless you are a master gardener or able to recognize poisonous plants and flowers well, it’s safest not to bring any bouquet into your house… especially if you own a cat. True lilies – those of the Lilium spp. and Hemerocallis spp. - are frequently used in fresh bouquets because they’re really fragrant, inexpensive, and have a long-lasting bloom. The ones we worry about the most are the Oriental, Japanese show, Stargazer, day, and Tiger lilies. As little as 1-2 leaves - or even the pollen - can cause severe acute kidney failure when ingested by cats. Even the water in the vase is poisonous, and can cause poisoning if your cat drinks it directly. I personally hate lily poisoning, as this poisonous plant accidentally killed the cat that I gave to my sister years ago. Clinical signs of lily poisoning include vomiting, lethargy, inappetance, increased or decreased thirst and urination, halitosis (from kidney poisons building up in the blood stream) and kidney failure. If your cat does get into a lily, prompt emergency treatment is necessary, and includes decontamination (e.g., activated charcoal to bind up the poison), aggressive intravenous (IV) fluids to flush out the kidneys, anti-vomiting medication, and careful blood work monitoring for several days. 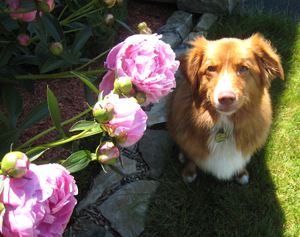 As for dogs, thankfully, these plants don’t cause serious harm – only in cats. When ingested by dogs, lilies will result only in mild gastrointestinal upset. While you may think those balloons are benign, the string or ribbon attached to it poses a significant health risk to your pet! Curious cats are more likely to be endangered, as they may swallow the ribbon or string, resulting in a linear foreign body. When swallowed, the ribbon often wraps around the base of the tongue or end of the stomach, and gets anchored or stuck there. As the string passes down the intestinal tract, normal intestinal contractions saw through the intestines, resulting in a life-threatening infection to the abdomen (termed a “septic peritonitis”). These requires an expensive emergency surgery, and isn’t worth the risk to your cat! The third most dangerous Valentine’s toxin? Chocolate. When it comes to chocolate, the general rule is: the darker and the more bitter the chocolate, the more dangerous it is (meaning that baker’s chocolate, semi-sweet chocolate, and gourmet dark chocolates are the most dangerous). So why is chocolate poisoning? Chocolate and cocoa contain chemicals called methylxanthines: theobromine and caffeine. These are stimulants, and can cause severe gastrointestinal signs (like nausea, vomiting, and diarrhea), cardiovascular signs (like a racing heart rate, hypertension, and heart arrhythmias), and neurologic signs (like anxiety, tremors or seizures). The other threat? If the chocolate is mixed with other foods that are toxic to pets: raisins, macadamia nuts, and espresso beans. If your dog gets into chocolate (thankfully cats don’t typically ingest enough), treatment includes decontamination (e.g., inducing vomiting and giving activated charcoal), IV fluids, anti-vomiting medication, blood pressure and heart monitoring, sedation, medications to control the blood pressure and heart rate, anti-seizuring medication, and supportive care. Lastly, sugar-free sweets or treats containing xylitol are poisonous. Xylitol is a natural sugar-free sweetener, and in non-primate species (e.g., dogs), it can cause a life-threatening drop in the blood sugar when ingested (due to a spike in insulin). In high doses, it can result in liver failure (termed acute hepatic necrosis) in dogs. Typically, the dose required to cause poisoning is at least 0.05 grams per pound of body weight (0.1 grams per kilogram of body weight). As xylitol is in everything nowadays (including mouth wash, toothpaste, sugar-free chewable multivitamins, sweets, gums, mints, etc. ), make sure to keep all these products away from your pet! When it comes to showing love to your two-legged pal, make sure to be careful of these common Valentine toxins that pose a big threat to your pets. If you do think your dog or cat got into something poisonous, contact your veterinarian or an animal poison control center immediately. Or better yet, avoid this list of four and love up your two-legged with better, safer, non-toxic, calorie-burning ways instead! How do you celebrate Valentine’s Day with your dog or cat?